The team at Insanity Tackle have been busy designing their latest lure labelled the Insanity Tackle ‘Mini Vibe’. Wayne Dubois AKA “Mr Freshwater” has sent FishingMad a full range of the Mini Vibe catalogue to road test. If your unaware Wayne is one of Australia’s most decorated fresh water sports fisherman. He has won many national fishing tournaments such as Australian Yellow belly Championships, Timberlake Legends & Lake Hume Classic. His featured in many Fishing publications and product developer for established brands such as JM Gillies, Gladiator, Rapala, Ugly Fish, Outlaw spinnerbaits, Balista lures and Kaos cod fly’s. The Insanity Tackle ‘Mini Vibes’ are a versatile silent lure with a soft rubber casing. They come in a range of 4 different colours ( blue gill, clown, red head and stripped carp ) which look great. They have a terrific vibration action on lifts, hops and retrieves. The vibe length is 45mm and weight is 12.7gms. 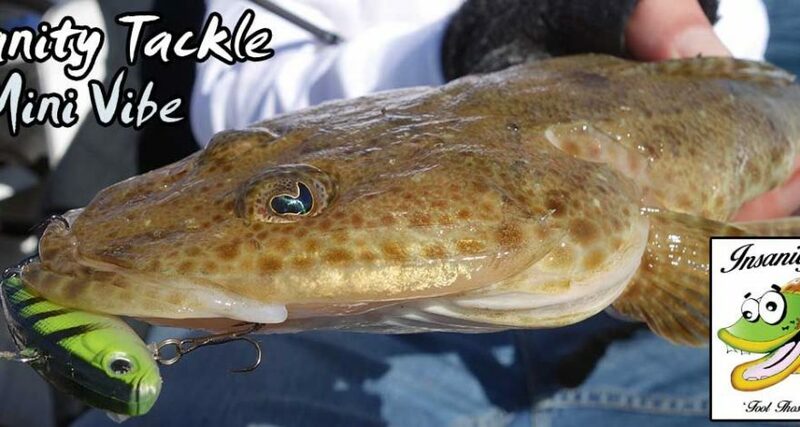 Which means they cast a mile making them an ideal lure choice when searching large areas, casting into strong winds and for getting down into the strike zone when fishing deep. Like most vibes and blades they are designed to be used with a hops and slow pauses but have also proven very successful by fast retrieving and trolling when targeting species like Trout. These lures were designed with fresh water species in mind such as Golden Perch, Redfin, Trout, yellow belly & Bass. But our road test proves that they are equally good on estuary species. When targeting Redfin the red head vibe was a standout. For Trout and Bream the more natural looking colours seem to work very whilst the matted finished vibes were a top choice in clear waters. But to put them to the real test the FishingMad crew ( Alan Bonnici and Mark Moseley ) decided to road tests them on the bay between Point Cook and Altona to see what interest we would have on saltwater species such as Flathead and Snapper. For our test we fished in depths between 6 to 9 meters, drifting to naturally cover greater distances. The method was simply casting out and allowing the vibe to sink to the bottom, then slowly hoping the vibe up with continual pauses and twitches. My outfit for the test was a Shimano combo of a Cranx 6.6 foot light rod and a Stradic Ci4+ 2500 reel spooled with 4 pound line. To my delight my very first cast produced a bite on the drop which was a nice little 27cm Flathead. 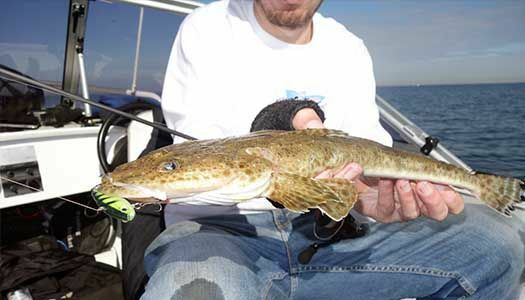 From then the action was red hot as we had continual hook-ups on Flathead ranging between 25cm to 40cm. I was amazed how even the smallest Flathead’s would give the large vibe a go. About 20 minutes into our session we hooked up to a beautiful 47cm Flathead that hit the natural coloured vibe mimicking a wounded bait fish after a couple of twitches. It was one hell of a battle on the light gear, but well worth the effort to land a 47cm Flathead. After an hour the bite finally slowed down we relocated and changed vibe to another colour. Applied some scent for good measure which got the action happening again. I went with the red head vibe which Immediately produced a lovely 38cm Flathead. We kept fishing with the vibes for another hour and in total ended up catching around 35 Flathead. It was a great morning. The conditions were very calm and it was a pleasure to catch many fish on the vibes. We kept a couple of Flathead which will make for a great feed. The colder temperatures will be a testament to why the pinkies were missing. But I’m confident in the right conditions both Snapper and Bream would happily fall victim to these vibes. We can conclude that the Insanity Tackle Mini Vibes are a versatile lure. They allow you to cover a whole range of freshwater and salt water species. They look great and cast a mile which make them great for both boat and land based application. At $15 a vibe these are an affordable choice.